Parkwood Collection is a new launch strata landed property which stands at 3 storeys high with attic. Each home is made out of 5 bedrooms and is also designed with an attic compartment, a private carpark, basement area, pool and other communal facilities to enjoy as well. This new development is on a 99 years leasehold plan well-developed by China-based Fantasia Investment (Singapore). State of art condo facilities soothes your soul and mind as you relax over the weekend with your families and friends. Chill at the lap pool, gym, jacuzzi, pool deck or BBQ with your friends. Spacious layout ensures that quality family time is never compromised. Be it having that family dinner, watching TV or cooking dinner together is always a fun thing to do as one. Branded electric appliances and branded finishes ensure the materials are build to last. In Parkwood Collection, luxury living is never compromised. When wandering around the corners of Hougang Avenue 2 and even at Upper Serangoon Road, plenty of reputable institutions are found making it a lot easier to send your kids through catering a much excellent teaching standard as they grow in time. Feel free to send them over at Holy Innocents High School, Serangoon Junior College, Montfort Secondary School, also in CHIJ Our Lady of the Nativity, Xinmin Secondary School, Serangoon Secondary School, the Punggol Primary, better yet in Bowen Secondary, Rosyth School, the Lycee Francais de Singapour, Serangoon Garden Secondary and Xinghua Primary which is just next to Yuying Secondary School. 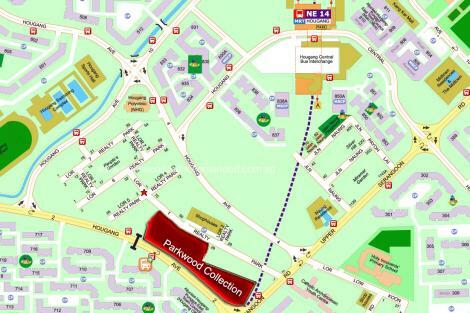 Residing at Parkwood Collection will lead one to its close proximity from the Hougang Mall, the Kang Kar Mall, Hougang Plaza, also from the Cold Storage, Heartland Mall, the Fairprice, Sheng Siong and the Giant. Parkwood Collection – Where Dreams Come True. Fantasia Holding Group is a leading property developer or can be better described as a top property related service provider in China. In 2009, Fantasia holding was the only property company in China who had its shares listed on the Hong Kong stock exchange. The shares were sold at an IPO of HK$ 2.2 per share. The group first commenced business in Shenzhen China in 1996 under the leadership of its founder, Miss Zhen Jie, a niece to China’s former Vice president, Zhen Quinghong. The holding’s over 22 years of existence has seen it expand and maintain focus on in four of the fastest economies in China: the Chengdu-Chonqing economic zone, the Pearl River Delta region, the Yangtze River Delta Region and the Beijing-Tianjin Metropolitan region thanks to its wealthy collection of experience as we as ability. Among the services that Fantasia Holding provides are property development, property operation services, property agency, hotel services, tourism, and entertainment among others. Due to their affordable services, the range of their clientele runs from middle to upper class families and individals as well as small to high growth enterprises. The Urban Complexes will be discussed first. These complexes are mostly sited in key areas of the Central business districts of major cities or emerging business districts with new development plans. These complexes combine; offices, retail shops, hotels and boutiques in one building project. The multiple award winning Chengdu Hailrun Plaza in Chengdu is an example of such. The second category of Fantasia’s focus are called Boutique Upscale Residences. The boutique upscale concept involves building of residential structures in countryside areas with natural scenery. These residential buildings are linked with the metropolitan center of the cities they are found by roads and expressways. These residential buildings are built in phases in other to manage the Holding’s capital and as well as increase the average selling price of the buildings. Fantasia is determined to focus its development plan on goods and services that will reach their target customers in the four prosperous cities of China; Chengdu-Chongqing, the Pearl River Delta, the Yangtze River Delta and Beijing-Tianjin. The holding in achieving its aim evaluates it target landed property based on geographic considerations besides its high consideration for low costing lands. Besides property development services, Fantasia holding provides professional services at property operation, property agency and hotel services. Their beliefis that engaging in these property related services help to strengthen their property development abilities. Hence, their property operation services have helped to upgrade the value of their developed properties on the one hand. On the other hand, their property agency device has aided then in maximizing marketing efforts. Testimony to Fantasia holding’s excellence is the multiple award winning status of this organization. In 2008, Fantasia Group (China), won the 2008 Corporate Citizen Award of Golden Brick for Real Estate of China awarded by the Boao 21st Century Real forum and the 21st Century Economy Review. How about the award winning Chengdu Hailrun that won several awards even before its completion in 2009? Such are just some of the examples of the Holding’s success in the Chinese real estate market. Locals at Hougang district will eventually appraise a new creation of strata houses, Parkwood Collection situated at Lorong 1 Realty Park of the North East Region, Singapore. Hougang is a progressive enclave in the North East Region with a variety of impressive schools, shopping malls, even sports facilities and nature parks. Getting into its premise is quiet easy due to its boundaries where the Upper Serangoon Road and Hougang Avenue 2 meets. When going towards its location, any vehicle owners can take the Kallang Paya Lebar Expressway (KPE) at the eastern part of the district or through the Central Expressway (CTE) which is a convenient way to visit the Central region where an array of commercial sites and favorite attractions are found. Currently, a lot of amenities are in the works to prosper its vast territory with more commercial centres, residential properties, even more schools to look forward to, libraries, community club, sports complex and the likes. 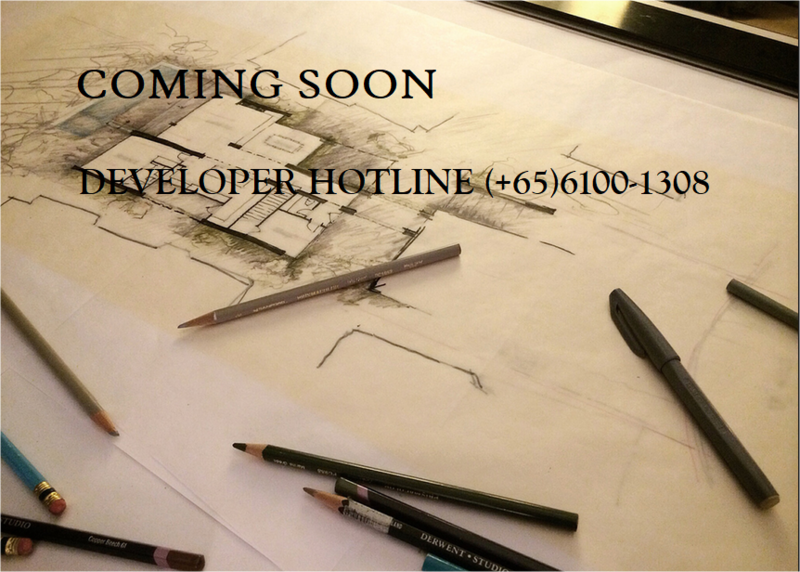 Especially with Serangoon as its neighbouring district, more projects are yet to come at this side of Singapore. Expect a growing population and tourist attractions in the next couple of years which will support its innovation and prosperity. 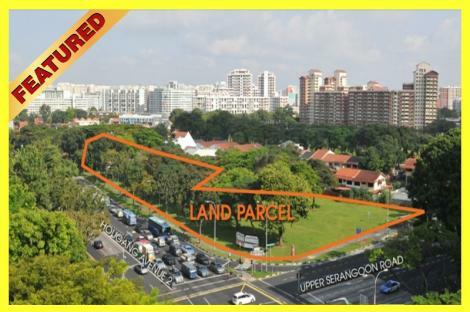 While the foreseen event is yet to happen, as of the moment, residential units in Hougang are relatively affordable. Therefore, owning a unit will eventually yield a higher return of investment when the time is right. Nearest MRT is actually Hougang MRT Station which is about 5 minutes walk away. This is part of North east Line which link from Punggol to Hougang and then to Town. On top of Hougang MRT Station, Hougang Bus Interchange is also beside it. 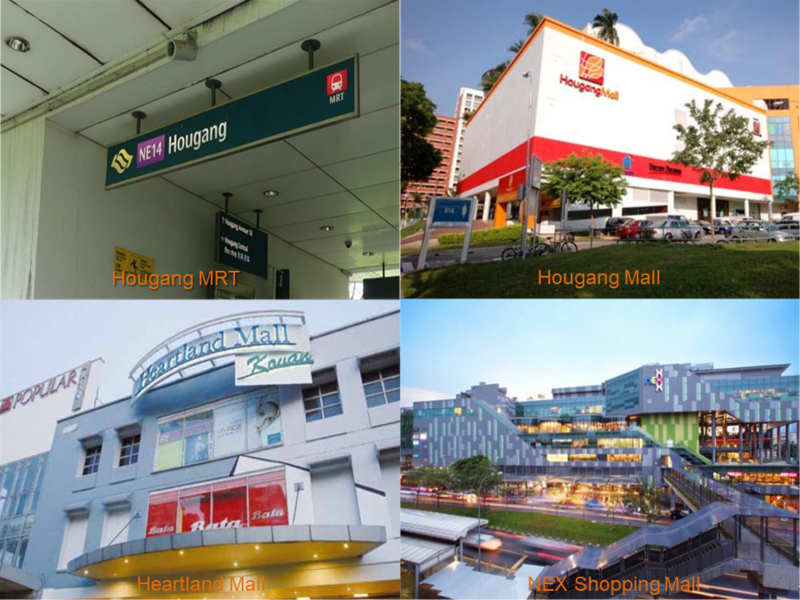 One of the nearest shopping mall is Hougang Mall, which is one of the more popular shopping mall in Hougang which has been around for few years. Other than buying groceries, there’s are also few famous local gourmet within the premises. One of the more popular shopping mall around is at Heartland Mall. It is well connected via Kovan MRT and there’s also hawker centre that serve numerous nice local food. Within the mall, there are supermarket, cafe, dental clinic and also fashion shops. ﻿Featuring the largest shopping mall in the North East region of Singapore, NEX Shopping mall is connected with Serangoon MRT Station and Bus Interchange. NEX Shopping Mall has almost everything under the sun, from cafes, restaurants, fashion shops to shopping mall.